Trimble Court Artisans lies just north of Old Town Square in Fort Collins, along an inviting walkway accessed from the Square or from College Avenue. The holiday rush is on for several artisans I’ve talked to recently. They’re scrambling to meet demand from retail and wholesale customers or to be ready for the next art festival. During the next few weeks, amid a surge of holiday gift buying, you’ll see numerous arts and crafts festivals listed under “What’s Happening,” in the right sidebar of this website, with links to more information. This week, though, while there’s an unusual lull in large festivals, let’s explore the closest thing to a permanent art festival I know of: Trimble Court Artisans off of Old Town Square in Fort Collins. Here you can buy a gift handcrafted by a local artisan right up to the last minute. 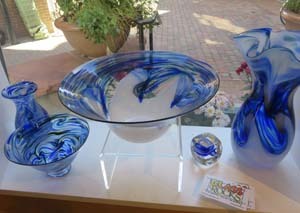 Glassware by Dottie Boscamp sits in the window of Trimble Court Artisans. Her business Glass Rocks was featured in a post on September 17. Anytime that you walk into Trimble Court (as the store is called locally) you can meet at least one of the artisans whose work is for sale there. This is an artisans’ co-operative; members take at least one turn a month behind the sales counter. Just ask, and the artisan at the counter will point you or even take you to his or her section of the store. You may run into other artisans as well. All members of the co-op are responsible for keeping up their own space – cleaning and dusting it, organizing it, and keeping it stocked. That probably explains why all of the current members live along the Front Range of Northern Colorado, although membership only requires that they live somewhere in Colorado. 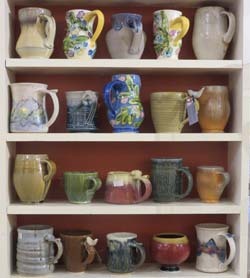 Mugs made by several members of Trimble Court Artisans Co-operative share shelves near the front of the store. 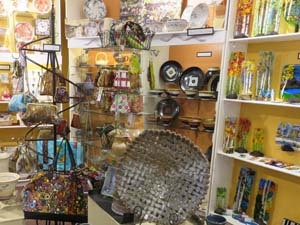 Directly in front of you when you enter the store, a sizable display features work by the artisan of the month. Right now it holds jewelry made by Sarah Blessing; next month Christina Hellyer will set her cottages sculpted from clay in the honored spot. For December, Trimble Court plans a special display – holiday ornaments by any of the artisans who wish to contribute. Mixing artisans’ work isn’t the norm at Trimble Court; its ongoing display of ceramic mugs by the co-operative’s potters is an exception. Against a wall just to the left of the month’s special showcase stands a set of shelves displaying mugs by several artisans. Trimble Court manager Jill Popplewell told me she enjoys watching customers pick up each one to try it out for weight and feel. The mugs are works of art, but they’re practical too; modern glazes have made them microwave-safe in most cases. I have to admit I was surprised when I spent a long time browsing at Trimble Court earlier this month. There’s so much to see that I hadn’t realized on my brief visits during the past year or two just how many new types of merchandise were awaiting discovery. 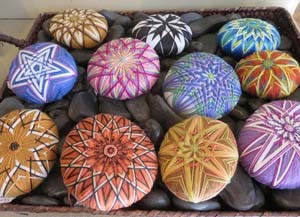 Inspired by Temari, Becky Margenau covered these river rocks with felt and added elaborate designs with thread. They sell at Trimble Court Artisans for an unbelievably low price. There are now 58 members of the artisans’ co-operative, more than ever before, including artisans and fine artists. Four times a year, the board considers the work of potential members. It looks for quality work that’s fun, exciting, saleable . . . and unique. Let me show you some things I hadn’t seen the last time I took a really good look around the store. 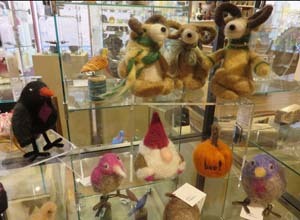 Whimsical figures of felted wool by fiber artist Fran Bowen await holiday shoppers at Trimble Court Artisans in Fort Collins. Around the corner from Becky Margenau’s display I discovered the work of another fiber artist, Fran Bowen. Fran makes whimsical figures by felting wool — a process that tangles wool fibers as the artisan builds three-dimensional shapes. On the wall nearby hangs fiber art by Diana Zweygardt. Throughout the store, more fine art fills the walls than I had previously seen in Trimble Court. There’s more pottery than ever, too – the work of nearly 20 ceramic artists. What didn’t surprise me was a fine display of ceramics by Chris Wolff, who was featured in a post on August 24. Kathi Dougherty, featured on September 3, has an eye-catching display of fused glass. In the window is the work of glassblower Dottie Boscamp, whose work appeared in a post on September 17. Trimble Court is open seven days a week, almost every day of the year. By December it will extend its evening hours to 8:00 p.m. Monday through Saturday until December 24, when it will close at 4:00 p.m. More information on hours is on its home page. 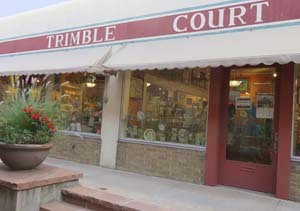 Trimble Court Artisans offers a wide variety of handmade items almost every day of the year. Prices are generally as low or lower as you will find at art festivals. Customers who love an artisan’s work are welcome to contact him or her directly for special requests. If business cards are missing at an artisan’s display, there are usually extras on a rack below the sales counter. For the convenience of both customer and artisan, a special order placed directly with a member of the co-operative can be picked up at the store. Trimble Court Artisans has a wonderful website for browsing. Artisans are listed by category, which includes all of those you see on this blog plus items for the home, greeting cards, painting, and photography. In many cases, you can click on artisans’ icons and see more of their work. I find there’s nothing like seeing something handmade in person, though, to appreciate how beautiful the work is. In case you’ve never been to Trimble Court before, here are some directions to help you find this tucked-away treasure. Walk into the heart of Fort Collins’ Old Town Square, northeast of the intersection of College and Mountain Avenues. When you reach the fountain topped by a sculpture of wild geese, walk through the break in the buildings across from it. You found it — Trimble Court Artisans! This entry was posted in Shops and tagged ceramics, fiber art, Fort Collins, gift, glass, holidays, Trimble Court on October 22, 2014 by Sally. another good one and certainly timely for the holidays! Thanks, Carol. It was fun to take a good look around again.